A press copy of Minotaur’s Bargain was provided for the purposes of this review. Minotaurs are usually depicted as just another monster, one that happens to be found in mazes and labyrinths thanks to Greek Mythology. Fantasy author Richard A. Knaak transformed the horned humanoids into a rich culture within the Dragonlance universe, one that I gobbled up back in high school and college. “Minotaur’s Bargain” runs with that same concept of Minotaurs as a tribal warrior culture, not unlike the orcs of Warcraft. It’s a neat idea but the adventure somewhat squanders potential role-playing interactions in favor of a standard deathtrap dungeon. The adventure is a mini-dungeon crawl designed for a party of 5th level characters, with a suggested play time of 3-4 hours. It’s relatively tiny compared to P.B. Publishing’s other material, running at only 12 pages not including maps and statblocks. The adventure hook has your player characters arriving at a Minotaur settlement to seek a potential alliance. The Minotaurs only respect strength, however, and no matter how negotiations go, the PCs are thrown into the arena. 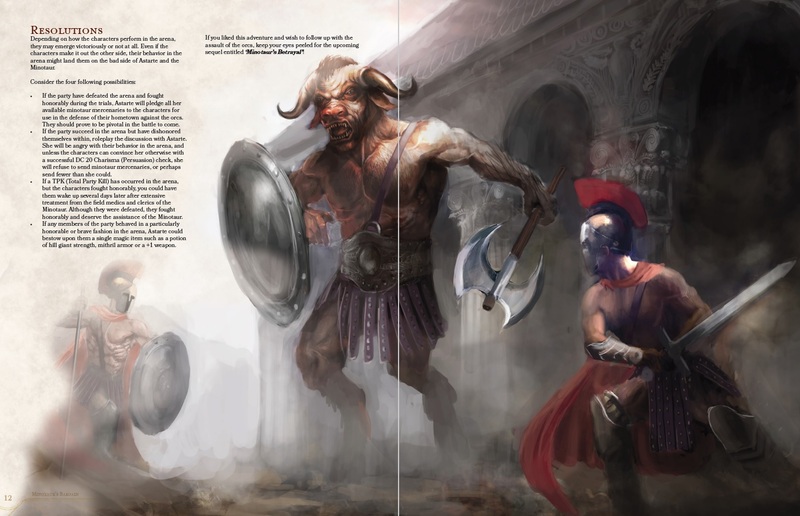 The PCs have a chance to role-play with the powerful Minotaur leader, but the result is the same regardless. Given the title of the adventure and the fantastic Foreward by Knaak himself, I was expecting a much more story-heavy adventure. Instead after that initial confrontation, the PCs are dropped into a dungeon full of fairly standard traps. The arena is divided up into four separate challenge rooms that must be overcome before the fifth and final challenge (a big boss fight) opens up. It feels very video game-y, but that’s not necessarily a bad thing. In the initial room the PCs are told to bring only one item with them – including clothing, armor, or arcane foci! Most PCs are going to balk at this, and there are rules and notes for anyone who wants to try and smuggle in more items (um, where exactly are they hiding them??). I’m always leery of taking away power or agency from my players. Stripping them of beloved loot makes everything in the dungeon much deadlier than normal. A potential Minotaur ally named Partheos can be found at the entrance. I enjoy when the DM gets to add an ally to the party, often serving as an organic way of imparting information or narration to the players. But Partheos is written as more of a brief font of information for the challenges ahead. He is young and cowardly which could have some interesting repercussions, though the notes on roleplaying him are minimal. Areas contain the standard array of dungeon traps, including ground spikes, spinning scythes, pressure plates with wall darts, and a 60 ft pool with a Darkness spell. The goal in each room is to simply pull a lever. I don’t see why any spellcaster with the Mage Hand cantrip and/or 3rd level spells like Fly, Alter Self, and Gaseous Form couldn’t complete most rooms without breaking a sweat. There’s not a lot of combat. The spike trap room can potentially include some random beasts, while the scythe/wall dart room has a unique orc variant called a Gladiator. The final battle is against a crazy powerful CR 8 Minotaur boss with legendary actions! The most interesting feature the dungeon offers is in integrating the arena crowd. You’re not in some underground tomb – you’re in a gauntlet-style arena with a cheering (or jeering) crowd all around you. If the PCs perform honorable deeds or heroic actions (or roll a crit), the crowd will cheer, resulting in either Inspiration, or throwing out useful items like a Potion of Healing. On the flip side if the heroes act cowardly or the crowd notices their smuggled items, the fickle crowd will hurl rocks at them, making attack rolls and dealing damage. This is a great feature that really drives home the fact that the PCs are proving themselves in an arena instead of crawling through just another dungeon. Since the PCs are supposed to prove themselves, the outcome can vary depending on their actions. Even if they fail and wipe (that last boss fight looks scary considering the PCs are near-naked and probably quite wounded) they could be revived and exonerated for a job well done, completing the mission and securing the Minotaurs’ help. 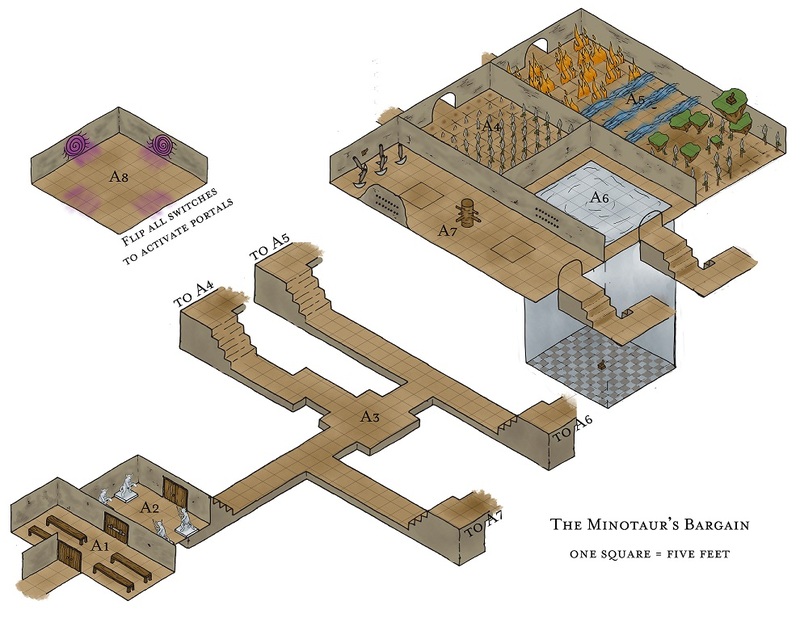 The adventure includes a full map of the arena, with seven separate room images and one big dungeon map that connects them. The pictures look really great in an isometric style, but unfortunately that style isn’t really usable in a virtual tabletop like Roll20. You could still use the pictures as handouts, but you’d have to rebuild the dungeon. Thankfully it’s not very big or complex. 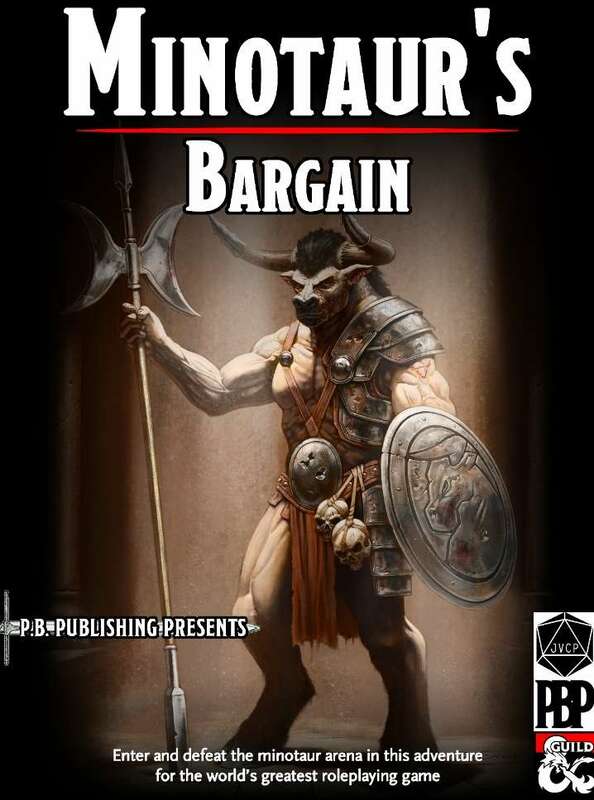 For a one-shot deathtrap dungeon “Minotaur’s Bargain” is serviceable, offering some interesting challenges and a neat feature with the arena crowd. But it’s quite short, and doesn’t fully utilize the Minotaurs themselves (there’s not even a maze!). The adventure is designed as part one of a trilogy of adventures on the DMs Guild, and I’m hoping the others do a better job of exploring Minotaurs from a more interesting role-playing and political perspective. The arena crowd is a neat feature with well-integrated mechanics. Particularly amazing art on the cover and throughout the adventure. The isometric maps are also lovely. Spiffy Foreward by fantasy author and Minotaur scribe Richard A. Knaak. Role-playing is limited to the very beginning, and the PCs are thrown into the arena regardless. Challenge difficulty feels artificially enhanced due to stripping the PCs. The traps and levers seem particularly susceptible to PC spellcasters. Isometric maps aren’t really compatible with virtual tabletops like Roll20. The Verdict: Minotaur’s Bargain offers some neat features in its deathtrap dungeon but fails to utilize minotaurs in a meaningful way. Doesn’t sound like the most interesting adventure, at least from a role-playing standpoint.